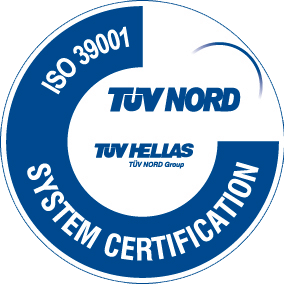 Transfer services all over Crete with Taxis, Mini Buses, Limousines and Buses. Pickup from any location in Crete. We, at the EloundaStarTransfers, would like to give you some details about our company and our services to you, our clients. As a company, specialize in "Transfers" to and from the airport, "Private Excursions", "Weddings" and "Social Events". Our company offers great value and service as we fulfill your needs. At the EloundaStarTransfers we use luxurious taxis and minibuses of well-known manufacturers, therefore we know that you will be pleased and happy with your choice of using us. Our professional drivers are experienced and provide you with the highest level of service and discreetness for VIP's/Businessmen/women and all our other clients. Our clients can be assured that they are transferred at their convenience and are certain of reliability and safety. A welcome at the Nikos Kazantzakis airport by a representative of our company is included in our offer. N.B. Our employees are legally authorised and permitted by the airport administration to enter the luggage reclaim area for the welcoming and assistance of our clients. During our clients' transfer to and from their hotel/destination, we offer cold water, Wi-Fi and mobile chargers, all at no extra charge! For any further information or assistance, please do not hesitate to contact us by Phone/Fax/Email. 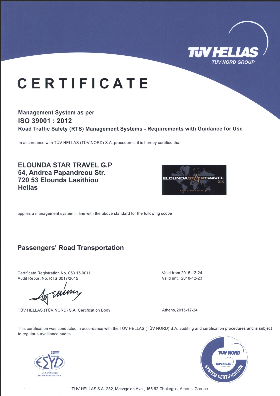 We are glad to inform you that Elounda Star Travel has implemented a Road Safety Management System (ISO 39001:2012) in the scope of fleet management for travelling around Crete via taxis, minibuses, buses and limos. Our RTS policy and objectives focus on diminishment of the possibility of road accidents, continual improvement of our performance and customer satisfaction based on an up to date risk assessment.